Growing up, I was never great shakes at breakfast food. Cakes and cookies, sure - pancakes, not so much. I realize an introduction like that probably doesn't instill you with too much confidence (considering this is a recipe for waffles) but practice makes perfect, and it doesn't hurt to have a bit of help. Thankfully, I've had more than my fair share of assistance - this recipe actually isn't mine, it's my partner Ian's. He did all the hard work of developing the recipe and I chipped in with one final, tiny tweak. This technique will take any waffle or pancake recipe to the next level, but I can't take credit for this brilliant innovation either; I learned this trick from a man named Tony while working 5 A.M. shifts at Empire State South. The key here is to separate your eggs, whip the whites, and fold them into your batter just before cooking. The air trapped in the whipped egg whites creates the lightest, fluffiest texture you could possibly imagine, while the exterior remains lovely and crisp. Life, changed (well, mine was anyway). Whipping the whites does make this batter slightly trickier, but trust me, it's well worth the few extra minutes. The two pitfalls you must avoid are over-whipping the whites (making them difficult to incorporate) and over-folding them once they're added (deflating the batter). The aeration means your waffles will be a bit rough around the edges (literally - you can see this in the photos); you might also notice a bit of inconsistency in colour. However, I assure you that these waffles will taste wonderful even if they're not 100% picture-perfect. They also freeze incredibly well, so if you put in the minimal effort now, you can reap the rewards of your work for weeks to come! * If you only have table salt on hand, cut this measurement down to 1/4 tsp. ** As ever, you can replace the vanilla with another extract if you'd like - almond, coconut, whatever works for you. Or, trying throwing in some spices - cinnamon, cardamom, apple or pumpkin pie spice, go nuts! (Just err on the side of caution - keep strong spices like cardamom to 1/8-1/4 tsp. For spice blends or less intense spices like cinnamon, between 1/2 and 1 tsp. should be okay. You can always add more next time.) 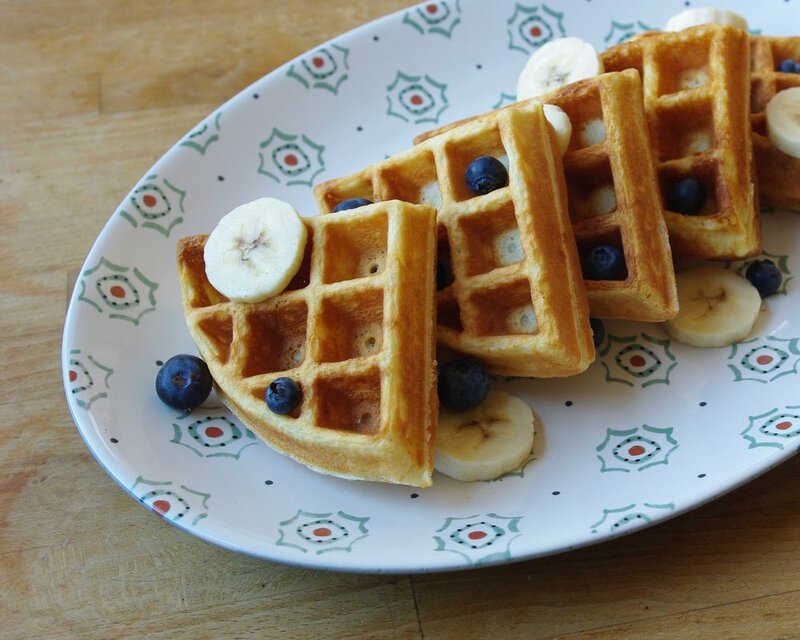 If you're feeling really adventurous and want to add things like chocolate chips or blueberries, hold back and sprinkle the fillings into the batter as you add it to the waffle iron - if you stir them into the batter they'll weigh it down and deflate the mixture as it sits (make sure to be extra generous with your non-stick spray too). 1. SEPARATE your eggs, taking care not to get any yolk in the whites (this will interfere with whipping them later). 2. TURN ON your waffle iron so it starts to heat up. If you plan on serving many waffles at once, you should also put your oven on the "warm" setting, or preheat it to no higher than 200°f. 3. COMBINE your dry ingredients in a large bowl. Give everything a good stir so it's well mixed, then create a little well in the center of your bowl. 4. WHISK together all of your wet ingredients, excluding the egg whites. 5. POUR your wet ingredients into the well you made in your dry bowl, whisking as you go. You want to do this gradually so the mixture becomes fully homogenous - first you'll get a very thick paste, then you can thin it out with the rest of your liquid mixture. If you try to just whisk everything together all at once you'll wind up with a chunky batter (which won't play well with whipped egg whites). 6. WAIT five minutes - this gives the flour a little time to absorb the liquid you just added. Do not start whipping your whites until the five minutes have elapsed! 7. WHIP the egg whites until they've reached soft-peak consistency. Watch them like a hawk and stop to check the egg whites frequently - the difference between soft-peak and stiff-peak can be a matter of seconds. If they get to medium-peak, don't sweat it - they shouldn't be too difficult to fold in. Stiff-peak whites will give you a much harder time; you'll either wind up with chunks of unincorporated egg white in your batter, or it'll take so much effort to fold everything together that you'll completely deflate the mixture. 9. FOLD in another 1/3 of your egg whites, and be gentle this time. Fold in this addition until it's almost fully incorporated to the batter, but not quite, then add the remainder of your egg whites and fold, gently, until the mixture is just barely homogenous. The batter should look a lot more bubbly now. 10. SPRAY your waffle iron with a light, even coat of non-stick spray. Too much oil will cause the waffles to darken much faster. 11. POUR or ladle in enough batter to fill the bottom of your waffle iron. Close the waffle iron and wait three seconds. 12. FLIP the waffle iron and wait 2.5 minutes. Flip again, then cook for 2 minutes more. Note: these cooking times might have to be adjusted, depending on the size and power of your waffle iron. 4.5 minutes total is long enough to give me a nice golden brown colour, but treat your first waffle as the tester and adjust your cooking time accordingly (that's why I said "the first one might be kind of ugly" in the recipe yield). Repeat this process until you've run out of batter, making sure there's a fresh coat of non-stick spray on the waffle iron every time you add more batter. 13. PLACE the waffles on a sheet pan (if keeping warm) or a cooing rack (if saving for later) in a single layer - you should avoid stacking the waffles so they don't become compressed. If you're keeping the waffles warm and serving them shortly, place the sheet pan in the oven and add the rest of your waffles to the tray as they cook. Just don't keep them in there for hours, or they'll dry out. 14. 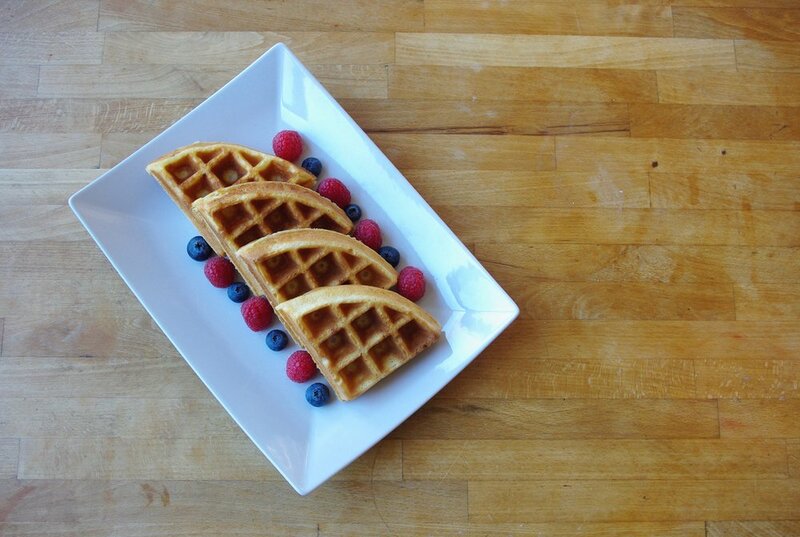 SERVE the waffles warm and finish with toppings of your choice. I typically go for maple syrup and berries, but the options are limitless! If I'm feeling more decadent, I usually go for bananas, blueberries, and Nutella. 15. STORE any left over waffles in gallon zip-top bags and freeze. I can usually fit two or three in a single gallon-bag, just put a piece of parchment between waffles so they don't stick together. You can reheat frozen waffles in a toaster oven or conventional oven set to 325°f until warmed through (350°f for super-crispy waffles) or you can use the "frozen waffle" setting, if your toaster oven has one.